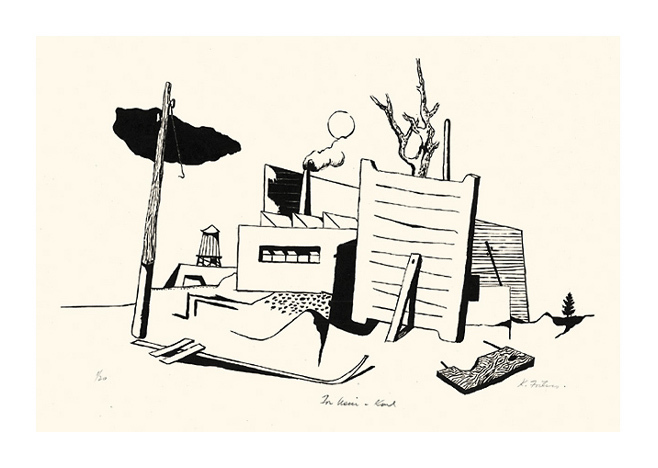 Untitled (Surrealist Landscape with Placards) - - c.1940, Lithograph. Edition 20. Signed and numbered 20/20 in pencil. Inscribed For Usui in the bottom center margin. Image size 9 x 7 1/2 inches (229 x 191 mm); sheet size 13 x 9 7/8 inches (330 x 251 mm). A fine, rich impression, on cream wove paper, with full margins (1 1/8 to 1 3/4 inches), in excellent condition. Scarce. Provenance: Estate of Francis Pratt. 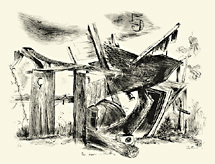 Francis and her husband Bumpei Usui were fellow Woodstock artists and friends of Fortess. 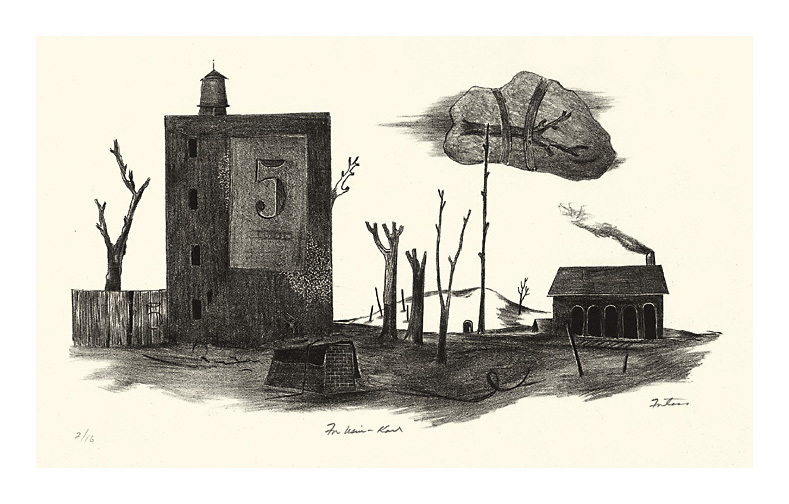 Untitled (Surrealist Landscape with No. 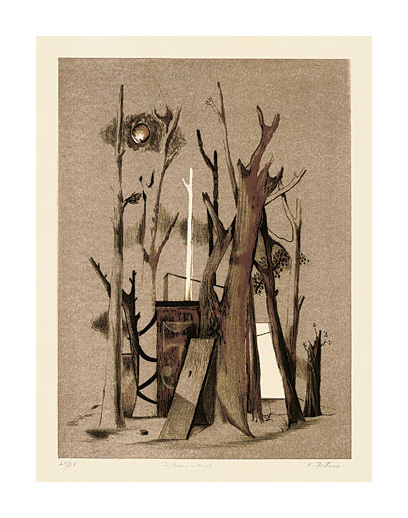 5) - - c.1940, Lithograph. Edition 16. Signed and numbered 2/16 in pencil. Inscribed For Usui - Karl in the bottom center margin. Image size 6 3/4 x 12 3/8 inches (171 x 314 mm); sheet size 12 x 17 3/8 inches (305 x 441 mm). A fine, rich impression, on cream wove paper, with full margins (2 1/8 to 2 5/8 inches), in excellent condition. Scarce. 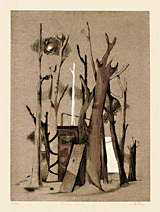 Tanks & Trees - - c.1940, Lithograph. Edition 100 proofs. Signed, titled and numbered 100/P in pencil. Inscribed For Usui - K. in the bottom left margin. Image size 13 1/8 x 10 inches (333 x 254 mm); sheet size 18 1/4 x 13 1/8 inches (464 x 333 mm). A fine, rich impression, on cream wove paper, with full margins (1 1/2 to 3 3/8 inches); four small tears (1/4 to 3/5 inch) on the bottom sheet edge, and slight crease across the top right sheet corner, all well away from the image; otherwise in excellent condition. 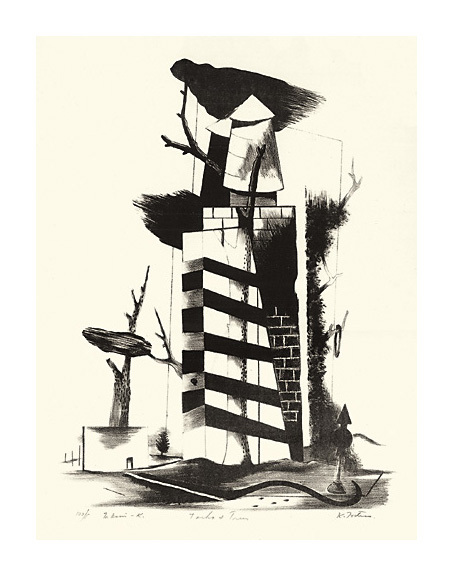 Untitled (Surrealist Landscape with Industrial Ruins) - - c.1940, Lithograph. Edition 20. Signed and numbered 4/20 in pencil. Inscribed For Usui - Karl in the bottom center margin. Image size 7 3/8 x 11 7/8 inches (187 x 285 mm); sheet size 13 1/8 x 16 1/2 inches (333 x 419 mm). A clean, black impression, on cream wove paper, with full margins (2 1/4 to 3 9/16 inches). Traces of printing ink in the margins at the stone edge; several short repaired tears at the sheet edges; diagonal creases in the bottom left sheet corner; all well away from the image, otherwise in excellent condition. Scarce. Untitled (Surrealist Nocturne with No. 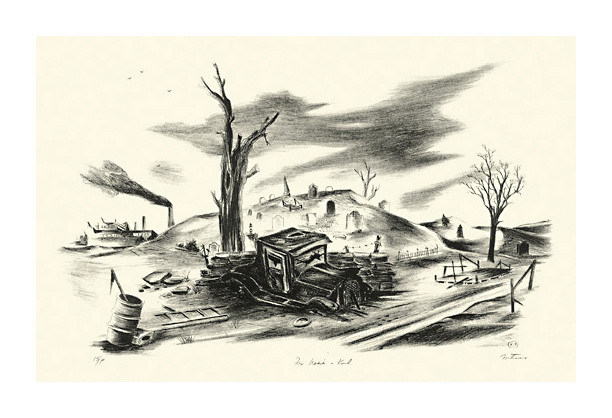 5) - - c.1940, Lithograph. Edition 18. Signed and numbered 1/18 in pencil. Inscribed For Usui - Karl in the bottom center margin. Image size 13 7/16 x 9 3/4 inches (341 x 248 mm); sheet size 17 15/16 x 13 inches (456 x 330 mm). A fine, rich impression, on cream wove paper, with full margins (1 1/2 to 2 1/4 inches). A short repaired tear in the sheet edge, well away from the image; a diagonal crease in the bottom right sheet corner, otherwise in excellent condition. Scarce. 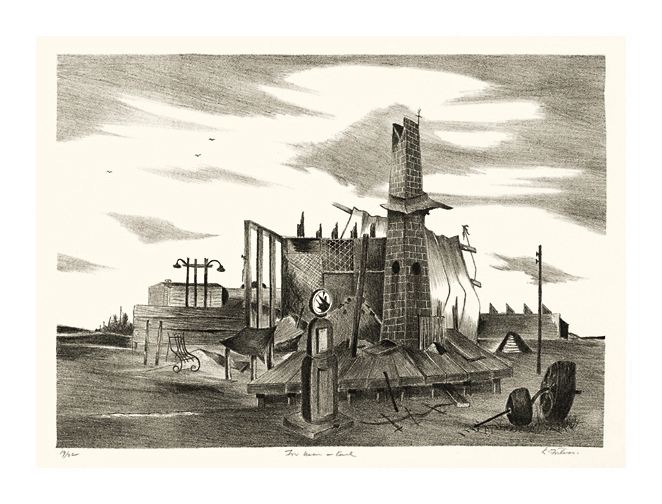 Untitled (Surrealist Landscape with Gas Pump) - - c.1940, Lithograph. Edition 22. Signed and numbered 19/22 in pencil. Inscribed For Usui - Karl in the bottom center margin. Image size 10 11/16 x 14 5/8 inches (175 x 371 mm); sheet size 13 x 18 1/4 inches (330 x 464 mm). A fine impression, on cream wove paper, with full margins (1 1/8 to 2 1/8 inches). Two short repaired tears in the bottom sheet edge, well away from image, otherwise in excellent condition. Scarce. 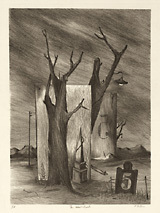 Untitled (Surrealist Landscape with Tree Stumps and No. 5) - - c.1940, Color Lithograph. 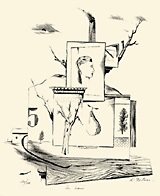 Edition 24. Signed and numbered 24/24 in pencil. Inscribed For Usui - Karl in the bottom center margin. Image size 11 7/8 x 8 3/4 inches (302 x 222 mm); sheet size 17 3/16 x 12 15/16 inches (437 x 329 mm). A superb impression with deep, muted colors, on cream wove paper, with full margins (13/4 to 2 3/4 inches), in excellent condition. Scarce. Untitled (Mt. 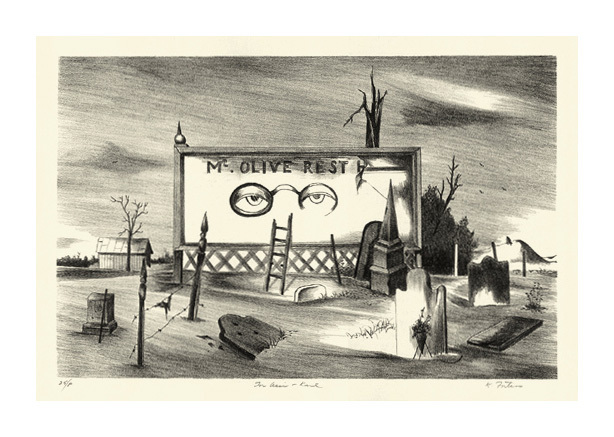 Olive Rest) - - c.1940, Lithograph. Edition 25 proofs. Signed and numbered 25/P in pencil. Inscribed For Usui - Karl in the bottom center margin. Image size 9 1/16 x 14 inches (230 x 356 mm); sheet size 13 1/8 x 18 1/8 inches (333 x 460 mm). A fine, rich impression, on cream wove paper, with full margins (2 to 3 1/8 inches), in excellent condition. Scarce. 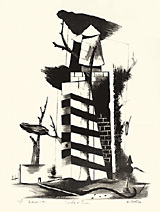 Untitled (Delapidation with No. 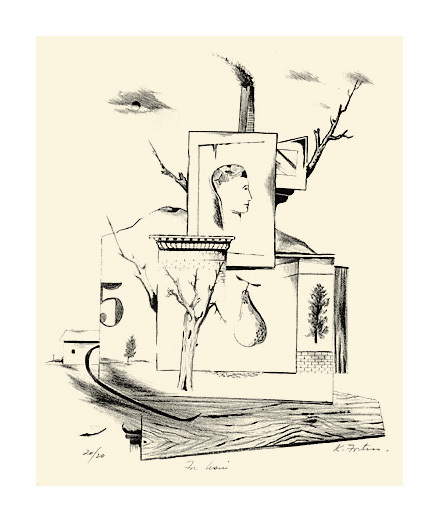 5) - - c.1940, Lithograph. Edition 12. 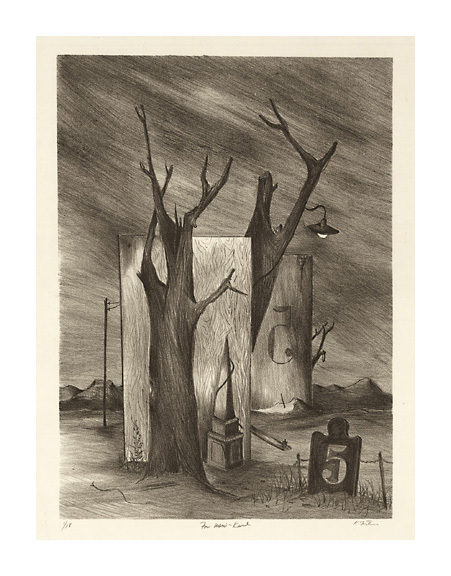 Signed and numbered 1/12 in pencil. Inscribed For Usui - Karl in the bottom center margin. Image size 8 3/4 x 14 1/2 inches (222 x 368 mm); sheet size 12 1/4 x 18 1/2 inches (311 x 470 mm). A fine, rich impression, on cream wove paper, with full margins (1 7/8 to 2 inches), in excellent condition. Scarce. 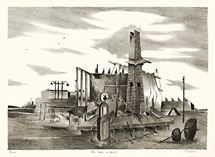 Untitled (Model T Memorial) - - c.1940, Lithograph. Edition 15 proofs. 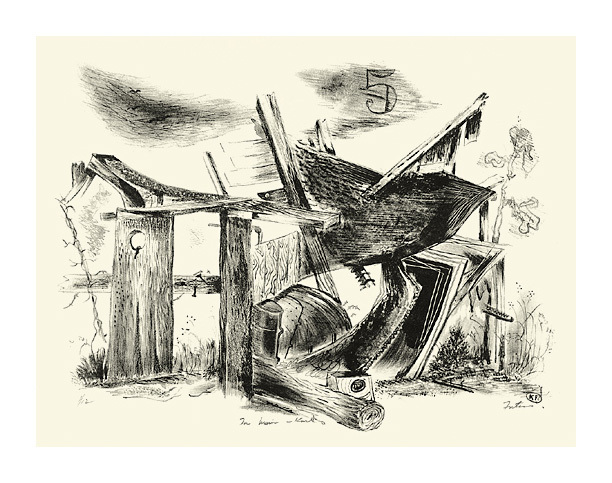 Signed and numbered 15/ P in pencil. Inscribed For Usui - Karl in the bottom center margin. Initials in the matrix, lower right hand corner. A fine, rich impression, on cream wove paper, with full margins (1 3/4 to 2 1/4 inches), in excellent condition. Scarce.